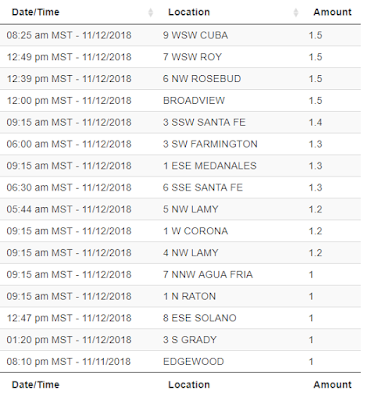 New Mexico Snowfall Totals - Nov 12th, 2018. Snow showers partially obscuring the Guadalupe's. Looking southwest at El Capitan and Guadalupe Peak from just north of the New Mexico/Texas state line on U.S. Hwy 62/180 southwest of Carlsbad, New Mexico. New Mexico Reported Snowfall Totals. (As Of 4 PM MST Monday, November 12, 2018). Note: I'm having trouble buying the report of 25" of snowfall 3 miles south of Farming ton. Totals are nowhere close to this amount near this report so I believe the report is in error. Snow showers partially obscuring the Guadalupe's. Looking southwest at El Capitan and Guadalupe Peak from a couple of miles north of the New Mexico/Texas state line on U.S. Hwy 62/180 southwest of Carlsbad, New Mexico. 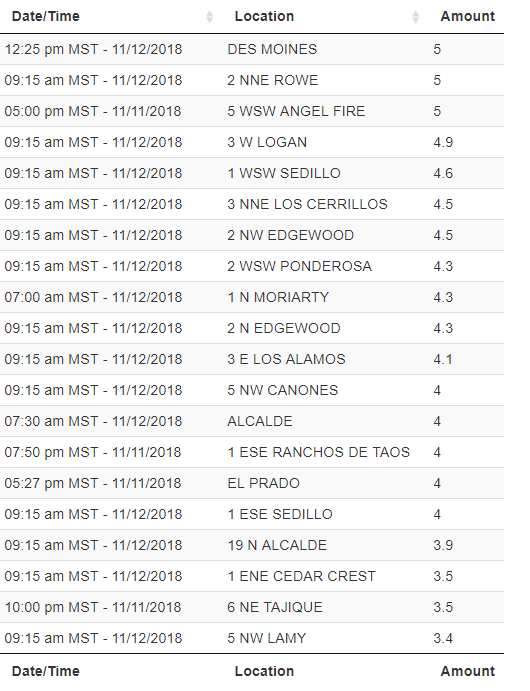 (As Of 8 AM MST Monday, November 12, 2018). 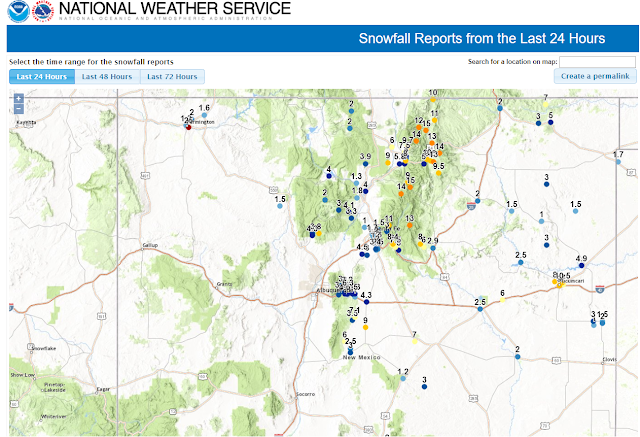 Note: Light snow and light snow flurries occurred across the Sacramento Mountains and the Southeastern Plains today. 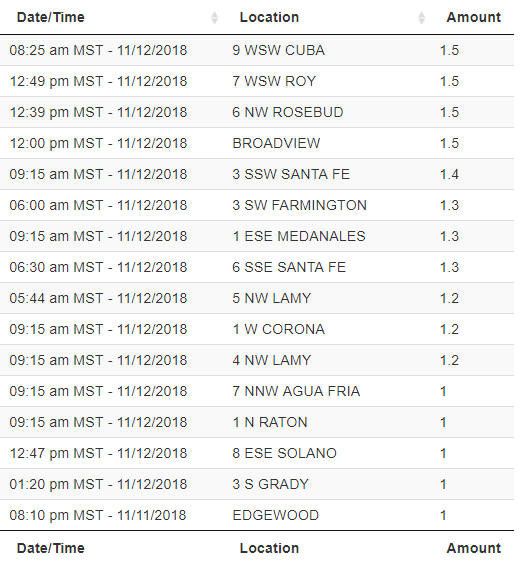 Those totals if any are not noted in these reports since the cut off time was 8 AM MST this morning. 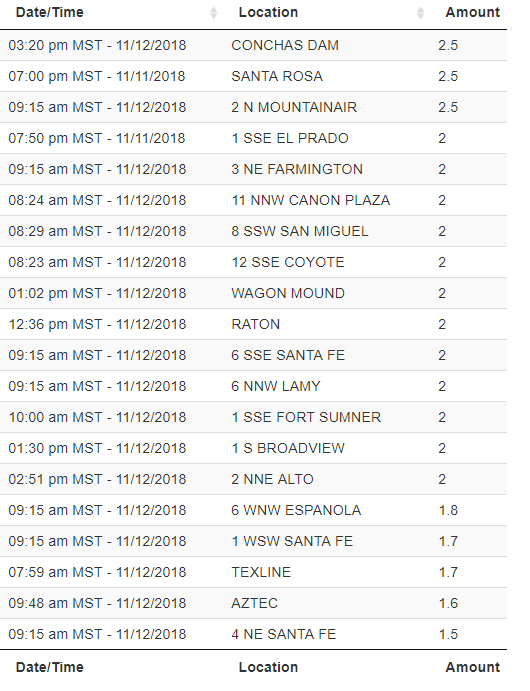 Flurries continued intermittently off and on through the day in the Pecos Valley with no reported accumulations. Snow showers over the Guadalupe's. Looking northwest from Texas Farm Market Rd #652 just southeast of the New Mexico/Texas state line. 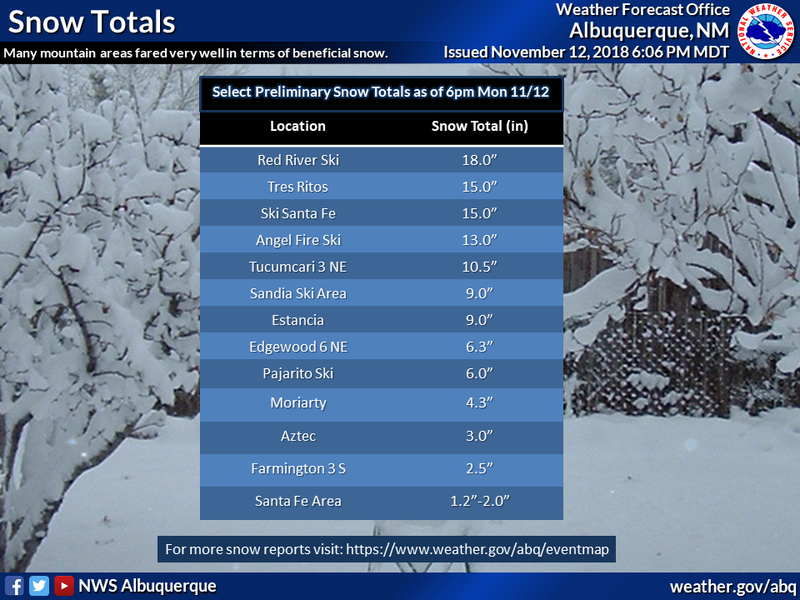 (Last Updated At 1:19 PM MST Monday, November 12, 2018). • 5 ESE RED RIVER - 15.0 in. • null TRES RITOS - 15.0 in. • 8 SE EAGLE NEST - 14.0 in. • 5 SSE LLANO LARGO - 14.0 in. • null EAGLE NEST - 13.0 in. • null RED RIVER - 12.0 in. • 11 ENE RED RIVER - 11.0 in. • 3 NE TUCUMCARI - 10.5 in. • 9 ENE SHADY BROOK - 10.0 in. • null TUCUMCARI - 10.0 in. • 11 ENE AMALIA - 10.0 in. • 1 E ARROYO SECO - 9.7 in. • 5 ESE BLACK LAKE - 9.5 in. • null ANGEL FIRE - 9.5 in. • 7 N PILAR - 9.0 in. • null TUCUMCARI - 9.0 in. • null ESTANCIA - 9.0 in. • 2 E GLORIETA - 8.4 in. • 3 ENE PONDEROSA - 8.0 in. • null TAOS - 8.0 in. • 2 S MINERAL HILL - 8.0 in. • 4 NW TUCUMCARI - 8.0 in. • 2 SW PECOS - 7.5 in. • 3 NW TAOS PUEBLO - 7.5 in. • 8 W MCINTOSH - 7.1 in. • 3 SSW ENCINO - 7.0 in. • 3 ENE TUCUMCARI - 7.0 in. • 6 NNE FOLSOM - 7.0 in. • 6 NW EDGEWOOD - 6.3 in. • null CUERVO - 6.0 in. • 2 SE MANZANO - 6.0 in. • 2 SE GLORIETA - 6.0 in. • 13 NW TAOS - 6.0 in. • 2 E SAN PABLO - 6.0 in. • 2 SSW LOS CORDOVAS - 5.8 in. • 5 WSW ANGEL FIRE - 5.0 in. • 2 NNE ROWE - 5.0 in. • null DES MOINES - 5.0 in. • 3 W LOGAN - 4.9 in. • 1 WSW SEDILLO - 4.6 in. • 3 NNE LOS CERRILLOS - 4.5 in. • 2 NW EDGEWOOD - 4.5 in. • 2 N EDGEWOOD - 4.3 in. • 1 N MORIARTY - 4.3 in. • 2 WSW PONDEROSA - 4.3 in. • 3 E LOS ALAMOS - 4.1 in. • 5 NW CANONES - 4.0 in. • null ALCALDE - 4.0 in. • 8 SSW RED RIVER - 4.0 in. • null EL PRADO - 4.0 in. • 1 ESE RANCHOS DE TAOS - 4.0 in. • 19 N ALCALDE - 3.9 in. • 1 ENE CEDAR CREST - 3.5 in. • 6 NE TAJIQUE - 3.5 in. • 5 NW LAMY - 3.4 in. • 1 WNW WHITE ROCK - 3.3 in. • 2 NNW EDGEWOOD - 3.2 in. • 4 E SAN ANTONITO - 3.2 in. • 5 ENE LOS CERRILLOS - 3.0 in. • 2 NNE YATES - 3.0 in. • 15 ESE CORONA - 3.0 in. • 1 SSW TIJERAS - 3.0 in. • null GRADY - 3.0 in. • 1 S MOUNTAINAIR - 3.0 in. • null AZTEC - 3.0 in. • null SEDILLO - 3.0 in. • 4 NE TIJERAS - 3.0 in. • null SANDIA PARK - 3.0 in. • 1 NE CAPULIN - 3.0 in. • 2 WNW PONDEROSA - 3.0 in. • 2 E SAN ANTONITO - 3.0 in. • 1 NNW ROMEROVILLE - 2.9 in. • 3 S FARMINGTON - 2.5 in. • 2 N MOUNTAINAIR - 2.5 in. • null SANTA ROSA - 2.5 in. • 5 NW LAMY - 2.4 in. • 12 SSE COYOTE - 2.0 in. • 1 SSE FORT SUMNER - 2.0 in. • null RATON - 2.0 in. • 1 SSE EL PRADO - 2.0 in. • null WAGON MOUND - 2.0 in. • 6 SSE SANTA FE - 2.0 in. • 1 WSW SANTA FE - 1.7 in. • 6 NW ROSEBUD - 1.5 in. • 9 WSW CUBA - 1.5 in. • null BROADVIEW - 1.5 in. • 7 WSW ROY - 1.5 in. • 3 SSW SANTA FE - 1.4 in. • 1 ESE MEDANALES - 1.3 in. • 3 SW FARMINGTON - 1.3 in. • 1 W CORONA - 1.2 in. • 1 N RATON - 1.0 in. • 8 ESE SOLANO - 1.0 in. • null EDGEWOOD - 1.0 in. • 7 NNW AGUA FRIA - 1.0 in. • 1 S SANTA FE - 0.9 in. • 1 E VALENCIA - 0.8 in. • 8 WNW FARLEY - 0.5 in. • 1 WNW CLAYTON - 0.5 in. • null JACONITA - 0.5 in. 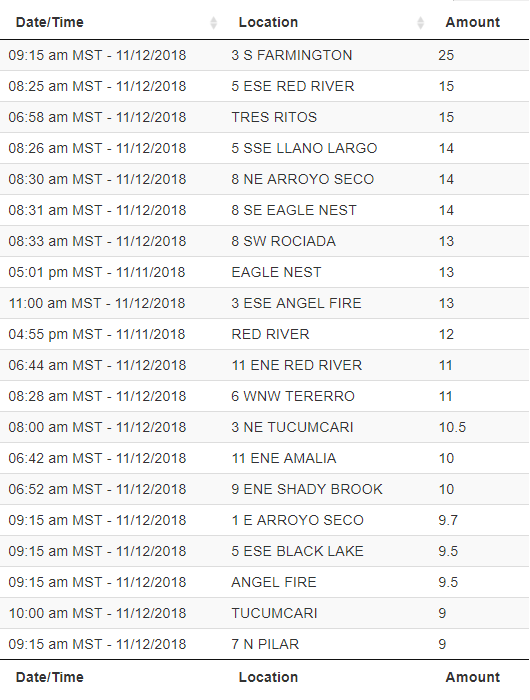 • 9 SE ALBUQUERQUE - 0.5 in. • 3 SW PORTALES - 0.5 in. 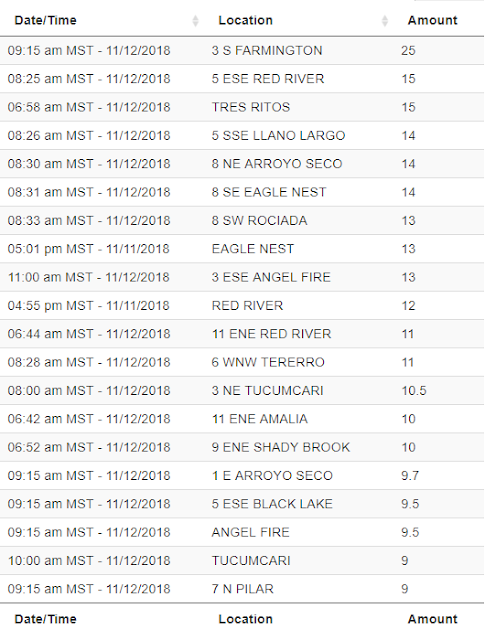 • 11 NW MESA - 0.5 in. • 7 WNW CANONCITO - 0.5 in. • 1 S PERALTA - 0.5 in. 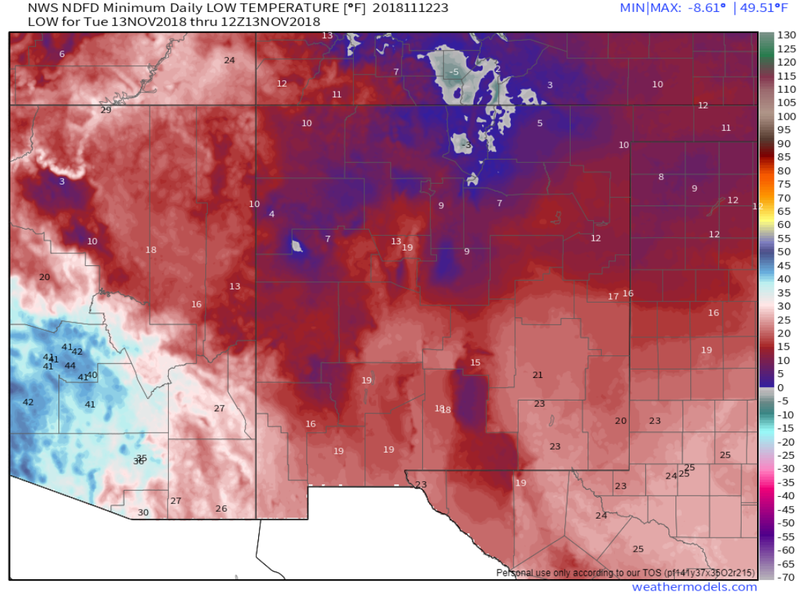 • 7 ESE ALBUQUERQUE - 0.5 in. • 12 NNW JEMEZ SPRINGS - 0.5 in. • 2 WNW CLOVIS - 0.5 in. 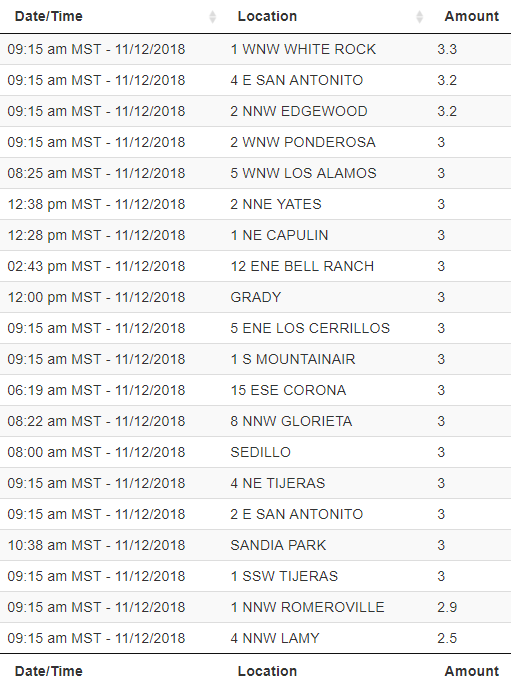 • 7 E ALBUQUERQUE - 0.3 in. • 10 ESE MAES - 0.2 in. • null RIO COMMUNITIES - 0.2 in. 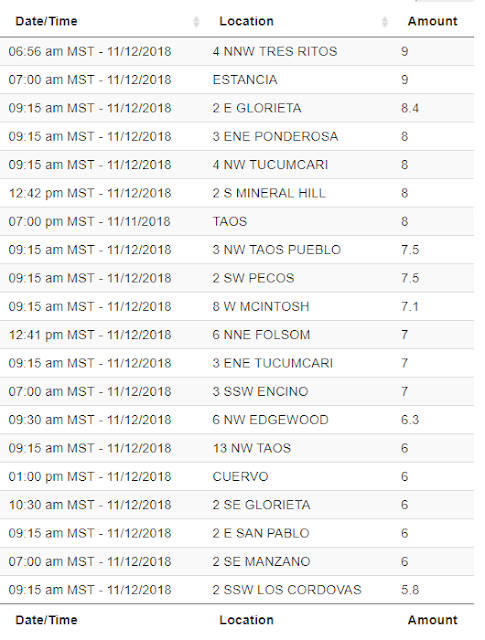 • 7 E ALBUQUERQUE - 0.2 in. • 3 NE BONITO LAKE - 0.1 in. 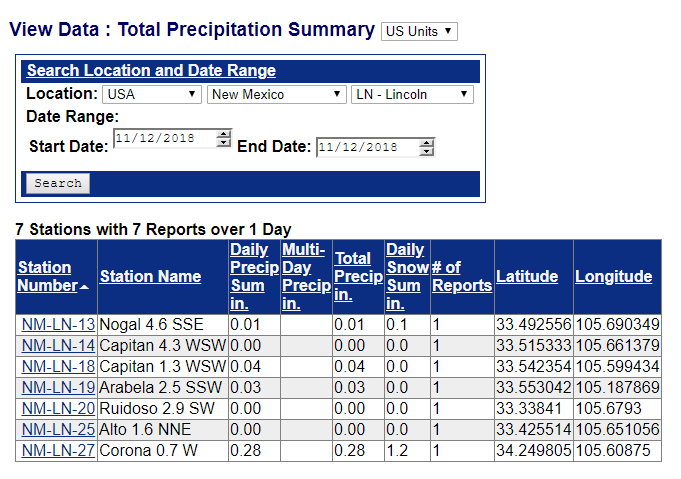 • 1 WSW LOS LUNAS - 0.1 in. • 5 ESE ALBUQUERQUE - 0.1 in. • null SAN FIDEL - T in. • 5 S ALBUQUERQUE - T in. • null CHAMA - T in. Our coldest night of the season to date is shaping up for the area. Locally we may even see some of overnight low temperatures tonight into Tuesday morning dropping below forecast levels. Some of the normally colder spots in the Pecos Valley nearby areas will likely drop down into the teens. Don't be suprised to see a few mountain valley locations getting close to zero.